Mega Evolution rule : When Freddy EX evolves into this Pokémon opponent's active Pokémon takes 50 damage. Flip a coin. If heads opponent's active Pokémon is asleep. If tails, opponent's next attack does 90 less damage. Heal this Pokémon 70 hp. Pokémon-EX rule : This Pokémon can attack opponent's benched Pokémon. 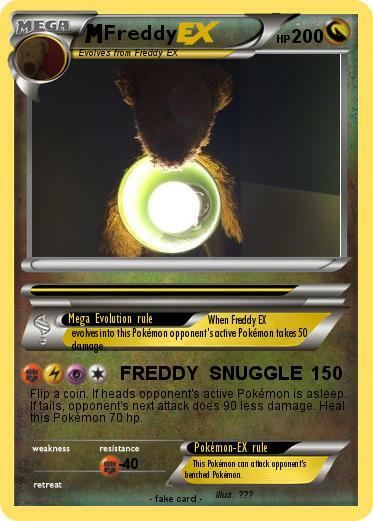 Comments : Freddy is the cutest Pokémon ever, and is so cuddly that he puts his opponents to sleep.